Though frequency and need varies, it is usually necessary to handle sheep several times per year for various reasons. Without an easy way to handle sheep and lambs, important tasks often get delayed or forgotten. Improper handling causes needless stress to both the sheep and the handler(s). A thorough understanding of sheep behavior is the first step towards developing an effective method of handling sheep. Their strong flocking and following behavior tends to make sheep easy to handle, relative to other livestock species. Conversely, sheep will prove difficult to handle if you force them to act in ways that are not natural for them. One of the most basic concepts in handling sheep and other livestock is the flight zone. All animals have a flight zone. A flight zone is an animal's personal space. It is where the animal feels comfortable and unthreatened. When a person is outside the animal's flight zone, the animal will turn and face the handler. It is best to work on the outside of an animal's flight zone. If the flight zone is penetrated too deeply, animal behavior can be unpredictable and dangerous. Sheep are not large, but they are quick on their feet and strong for their size. Pile-ups can result in small enclosures, causing injury to the animals, especially the small or weak ones. The size of an animal's flight zone varies. It depends how wild or tame the animal is. Sheep that have not had much human contact will have a large flight zone, whereas pet sheep may not have a flight zone. Sheep confined to a small space will have a smaller flight zone than sheep confined to a large area. Frequent, gentle handling tends to diminish the size of the flight zone. At the same time, sheep have excellent memories and can remember rough handling. Point of balance is another important livestock handling concept. The point of balance is at the animal's shoulder. All species of livestock will move forward if the handler steps behind the point of balance. They will back up if the handler stands in front of the point of balance. Many people make the mistake of standing in front of the point of balance while trying to get livestock to move forward through a chute. Sheep will usually refuse to move if they see people up ahead. Very often, you need to move sheep, to bring them in from a pasture or to move them to another pasture. If you don't have a herding dog to fetch the sheep, you can train the sheep to come to a vocal command or rattle of the feed bucket. Most sheep will come when they think they are going to get grain to eat. If these don't work, it will be necessary to go out to the field to get the flock and either drive them from behind or lead them with a feed bucket or lead sheep. Pet sheep are difficult to drive and make good lead sheep. If the sheep aren't familiar with where you want to move them, you may need several people to act as herders. Always move sheep slowly, calmly, and quietly. Do not allow splinter groups to develop. To move individual sheep, hold the sheep under its jaw and push its dock ("go-button"). Small numbers of sheep can be halter-broken for ease of moving and handling. Attempting to lead a sheep that is not halter-broken is usually a futile exercise. There are situations in which you need to catch an individual sheep. If you do not have a handling system to assist you, you can use gates and panels to make a small catch pen. You should make the pen small enough so that you do not have to chase the sheep. The smaller the catch pen, the easier it will be to catch the sheep. No one likes to chase sheep and the more you chase sheep, the harder it will become to catch them, not to mention the unnecessary stress you are causing both of you. 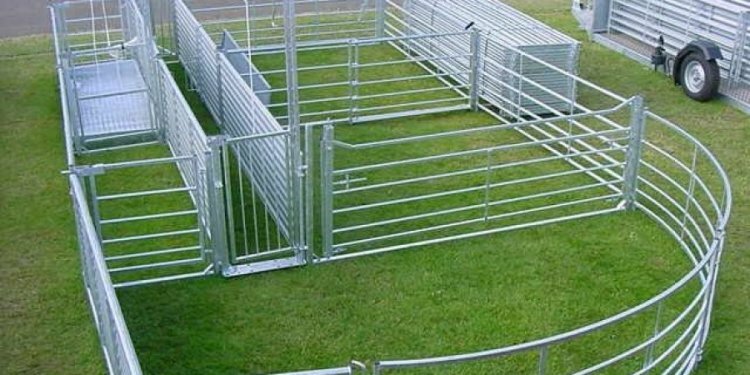 Once the sheep are in the catch pen, maneuver them into a corner and use your arms or a portable gate to form a visual barrier. Always approach sheep calmly and slowly. Cup your hand under the jaw of the sheep you want. Grab the bony part of the jaw, not the throat. Point the sheep's nose upward to stop its forward motion. If you keep the sheep's head up, you will be able to maintain control of it. Sheep have a lot more power when their head is down. You can also use a shepherd's crook to catch a sheep by the neck. If you cannot get close enough to the sheep to grab it under its jaw, you can reach for its hind leg or rear flank. Reach for the hind leg above the hock, then move your other hand up to control the head as soon as possible. Adult sheep are able to kick strongly, so this method works best for small sheep or young lambs. To catch an adult sheep, it is better to grab the rear flank. A leg crook can also be used to catch a sheep by the leg. The leg crook is especially useful in open areas. You should never catch a sheep by its wool. Not only is it painful to the sheep, but it can cause bruising to the carcass. There are many different ways to restrain a sheep, depending upon what you need to do to it. Once you've caught the sheep, you can press it against a wall or straddle it to limit its movement. A halter is one of the easiest ways to restrain a sheep for treatment or close inspection. If you want to trim a sheep's hooves or gain access to its underside you'll probably want to set the sheep on its rump. Setting a sheep on its rump is called tipping. Sheep in this position struggle very little and are easy to work with. To rest comfortable on its rump, the sheep should be off center, so that it is sitting on its hip and not is dock. If the sheep struggles, you can place a hand on its brisket to move it into a better position. There are several ways to tip a sheep. The method you use often depends upon the size of the sheep. Here's a common method for tipping sheep. Stand to the side of the sheep. Hold the sheep's head in your left hand by placing your hand under its jaw. Your left knee should be near or just behind the sheep's left shoulder. Your right leg should be touching the sheep's side near its left hip. Place your right hand on the sheep's back over the hips. Turn the sheep's nose away from you towards its shoulder. You should feel the weight of the sheep lean against your legs. Put pressure on the hips with your right hand so the sheep cannot pick its back feet off the floor. Take a step back with your right leg. The hind leg of the sheep should start to go down. Continue to bring the head around until the sheep is sitting down with its back leaning against your legs. Tipping larger sheep can be more difficult. A large sheep can be tipped by reaching underneath its body and grabbing its farthest legs, until it drops to its rump. Sometimes, this is a two person job. Small sheep or lambs can usually be tipped by holding them under their front legs, lifting them, and using your knee to push their rumps out.